Don’t Miss Out on the Miri Attwater and the Ocean’s Secret Special Price Ending 1/8/13! Don’t miss out! Pick up your copy in the Kindle Store of Miri Attwater and the Ocean’s Secret for the special 99 cent price! Coming soon! If you’ve been waiting on other ebook formats, Miri Attwater and the Ocean’s Secret is now uploaded to Kobo and Barnes and Noble nook awaiting their approval. Which one is the fastest at book approval? We’ll see! I’m currently working on a Smashwords upload as well. 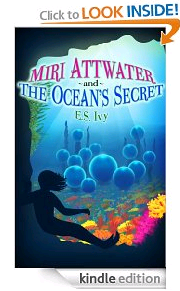 Miri Attwater and the Ocean’s Secret on an Amazon Top 100 List! Miri Attwater and the Ocean’s Secret is on an Amazon’s Top 100 list! It’s #33 on Amazon’s Top 100 Paid Best Sellers in Children’s Greek & Roman Myths! The mermaids in Miri Attwater and the Ocean’s Secret are based on the mermaids of Greek and Roman mythology. Miri’s last name is Poseidon and several of the other names used in the book are from mermaids of myth. As far as the actual myths go, though, I turned all of them on their heads. Do mermaids truly sing to lure sailors to their death? Not in Miri Attwater and the Ocean’s Secret! Find out what the mermaids are really doing when they sing. Click on the following link to pick up your Kindle copy of Miri Attwater and the Ocean’s Secret now at the special holiday price of 99 cents!